Or maybe channel popularity is a function of plain old survivorship bias. Life is unfair! Anyway, to analyze these new media success stories I turned to tuber, a handy R package that facilitates access to YouTube's API - just make sure to register via Google's developer console for the necessary ID and key. With a little wrangling I was able to compile a dataset of 92 YouTube channels previously featured as "Creators On The Rise," including comprehensive metadata (title, description, tags, duration, views) for 9,410 videos. All of this plus my code is available on Github. YouTube's selection criteria for a "Creator On The Rise" likely means this chart represents an overly optimistic view of the time it takes to become a YouTube superstar. In addition, it's worth noting that some creators may have had an existing following prior to creating their channel - Sophina The Diva, for example, has garnered 64K subscribers in a little over a month, but had the advantage of already being rather famous. Nevertheless, building a YouTube empire does not have to be a decades-long affair. 2. Will I Need A Viral Hit? It doesn't hurt. Let's return to the previously mentioned 007craft, a solo creator channel with around 39K subscribers. Mr. 007craft (I'm not sure anyone knows his real name) attracted attention earlier this year as the guy who was living in a storage locker. His video on the experience has collected over 3.5M views, representing an outsized portion of his channel's 11.8M total. In any case, have all 92 Creators On The Rise had a true viral hit? Subsetting the data to only the highest viewed video from each channel, we find that these top clips have a median view count of 553K. This is certainly a lofty bar for non music videos, but at least your channel doesn't have to garner a Charlie bit my finger level of fame to gain subs. Overall: viral hits help, but aren't essential. Most topics are fairly down-to-earth! There are fitness channels, family-oriented content, make-up tutorials and the like. And no politics! Perhaps YouTube is consciously refraining from naming political channels to the "On The Rise" section? Or maybe political takes aren't that compelling after all...we can only hope. Side-note: CatPusic might be my favorite of all the channels in the data. Consider adding a cat to your channel for an instant popularity boost. The attentive reader will have noticed an outlier in the second to last chart. The Rich Life lead the pack by far in terms of posting frequency, cranking out a ridiculous 6.5 videos weekly. For the uninitiated, The Rich Life follows a "homeschooling family of 7 that loves to share the good, the bad and maybe the occasional ugly." Of course, the idea of family as #brand is nothing new, but adding 200K subs in a little over a year is impressive regardless. The ALL CAPS titles alone entice a click, plus The Rich Life's thumbnails are attention-grabbing and effective. Also, the sheer variety of hijinks encountered is incredible! Note that if you have recently been kicked in the head by a horse, suffered a break-in, evaded a tornado, AND dealt with a police run-in...then you may have what it takes to be a top YouTube creator. 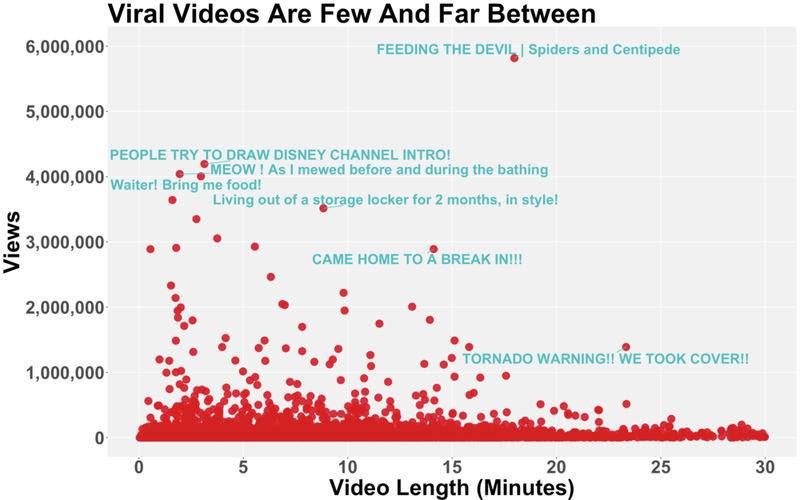 I hope this article has served as a somewhat tongue-in-cheek introduction to analyzing YouTube data via tuber. 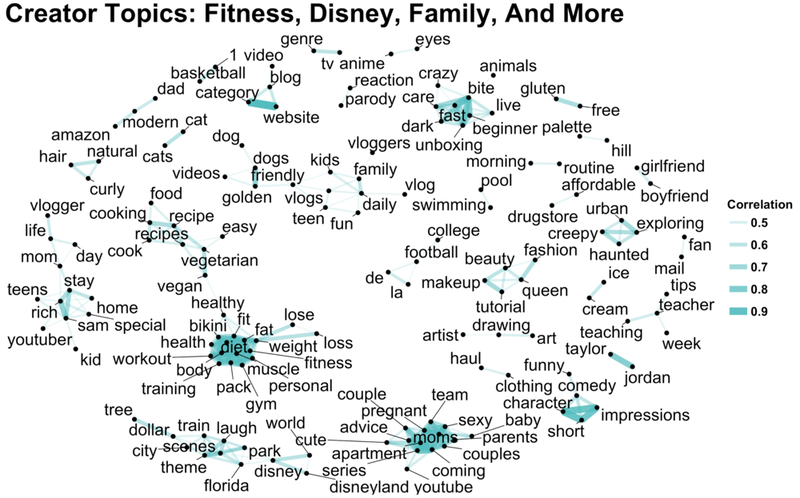 There's much, much more that could be done with what's available, from running sentiment analysis on video titles and descriptions to building models for subscriber growth or a video's likelihood of going viral. Once again, all project code can be found here. Thanks for reading!